→Spin Bin Review: A 60 Gallon Tumbler Composter That Spins! You don’t have to deal with messy compost, shovels and pitchforks when you’re using the Spin Bin Compost Tumbler. This composter is designed with an easy turning mechanism to allow for mixing of the material and adequate aeration without a lot of manual labor. The better aerated the compost is, the faster it will decompose. This tumbler contains a dual mixer bar and plenty of ventilation to provide maximum aeration. The convenient tumbler lets you add material at either end. That means that you don’t have to spin it before inserting your kitchen or yard waste. It holds up to 60 gallons. That’s ideal for people who don’t have large waste but still want the flexibility of a larger bin. It is guaranteed against defects for two years. 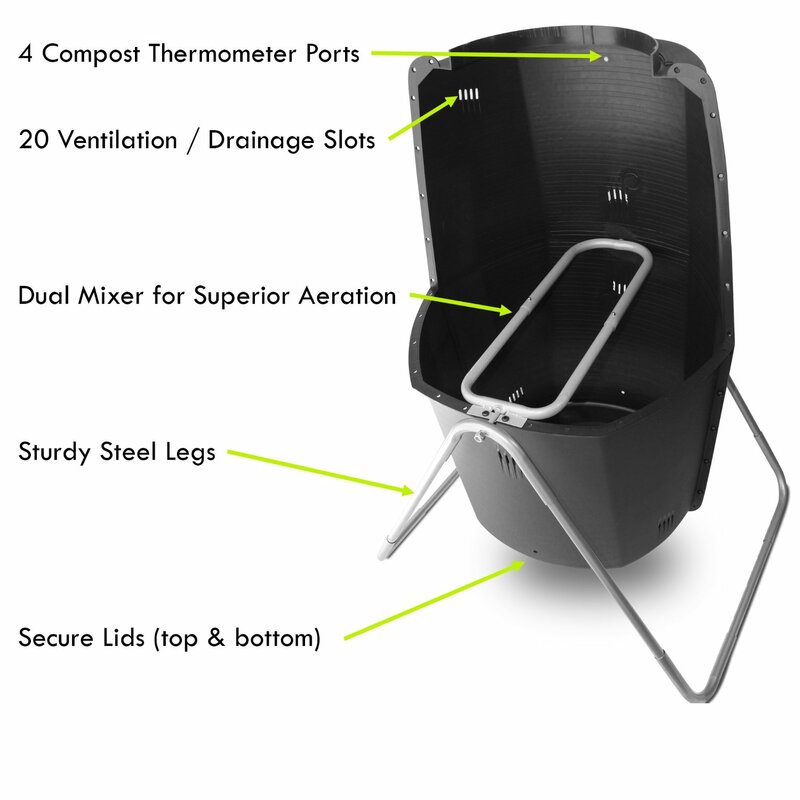 This composter accommodates more waste than many tumbler-style composters. It can hold up to 60 gallons, or 9.3 cubic feet of material. At 32” x 26”, the footprint makes it relatively compact, so you can squeeze it in near the garden or kitchen where you can access it easily. The 45-inch height is ideal for adding waste. The 1-inch diameter steel legs are powder coated for weather resistance and lock together for durability. They help provide a sturdy base that can hold between 50 and 100 pounds of soil in the tumbler. The legs won’t move or come apart when you’re rotating it. Twenty ventilation slots let air and rain to get in to create the ideal environment for decomposition. They also let it drain so that the material doesn’t become moist, rotten or smelly. You can easily monitor the temperature of your soil by inserting a thermometer (not included) into one of the four thermometer ports. This is important, because if you have to open the bin to insert the thermometer, you lose the valuable heat that is necessary for decomposition. The interior of the drum is ribbed, which allows for extra aeration and provides added durability. The lids lock into the bottom of the top and won’t come off while the drum is being tumbled. The heavier the drum, the more difficult it may be to turn it, but most users report that it’s not challenging even when filled completely. The spin bin is designed for outdoor use. Fast composting – You can turn the barrel as often as necessary to provide adequate aeration. 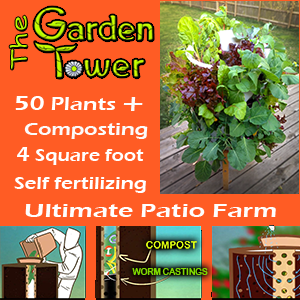 This speeds up the composting time compared with tower-style compost bins. No shovels – Turn the compost by rotating the bin instead of using a shovel or a pitchfork. This product is ideal for people who don’t have the capability to manually mix their compost. Sturdy legs – The legs are strong and weather resistant. They hold the composter off the ground, which prevents rodents and snakes from getting in. However, this can also prevent beneficial microbes from entering and helping with the decomposition process. Recycled plastic – Many people use compost because they’re concerned about adding waste to landfills. The drum is made in the USA from 100% recycled plastic, so it supports your environmentally conscious ideals. No mobility – It doesn’t have wheels. It gets heavy, so you won’t be able to move it to a different location in your yard once it has been filled with waste. Requires assembly – Although it’s easy to put together, you will have to assemble the Spin Bin before using it. Not insulated – Although the dark color helps with heat containment, the bin may get cold during the winter, prolonging the composting time. Difficult to empty – Some users have found the barrel cumbersome to empty. The bottom lid must be removed for emptying, and it’s situated too low to be dumped out into a wheelbarrow. A few users have found it difficult to insert a shovel to remove the compost. Most people find it easiest to place a tarp underneath the barrel and empty the compost onto the plastic. Then, they use a shovel to transport the compost into a bucket, wheelbarrow or garden. Is The Spin Bin Compost Tumbler Right For Me? The vertical shape of the Spin Bin tumbler tends to hold more compost than the horizontal styles. Compared with many other tumblers in the same price range, the Spin Bin has a larger capacity. This allows you to fill it up with more yard waste than some other tumblers. One of the downfalls to tumbler-style compost bins is that you’re constantly mixing up new and old materials. When you’re ready to remove your compost, you may have large scraps of organic matter that have not yet decomposed. You may have to sift those out and add them back to the tumbler. This may not be ideal for people who just want to remove a small amount of compost to add to houseplants or compact garden areas. However, because the compost develops more quickly in a tumbler, you should be able to transform your organic scraps faster than with a tower-style bin. The black color heats the contents well, especially during warm weather. You can easily monitor the internal temperature and adjust the position of the tumbler by dragging it to a sunnier spot or adding a different balance of organic matter to bring it up to the proper temperature. 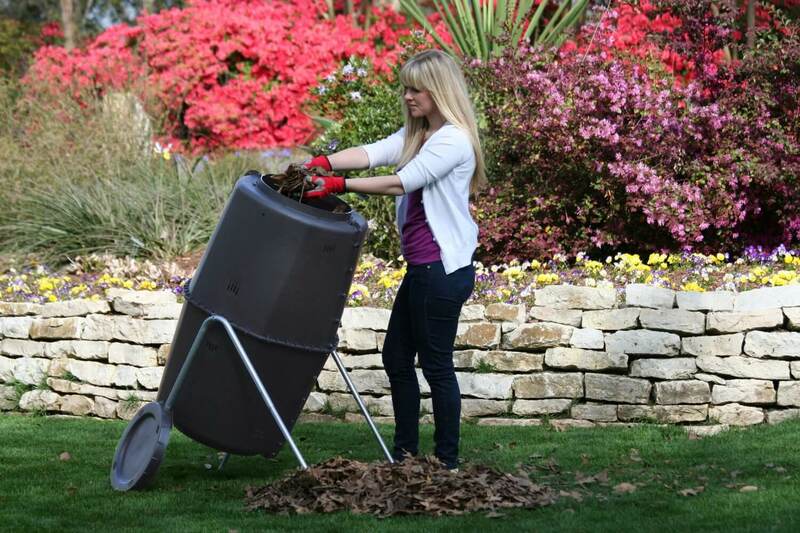 Overall, this is an effective composter for a relatively affordable price and we recommend it.